‘Perspectives on the World Christian Movement™’ is a dynamic 15-lesson discipleship course, designed to help local churches and individuals have a bigger view of God and His global purpose, and to equip them to fulfil their individual role within that purpose. Join 15 instructors over 15 weeks as we catch a vision of what God is doing in the world. 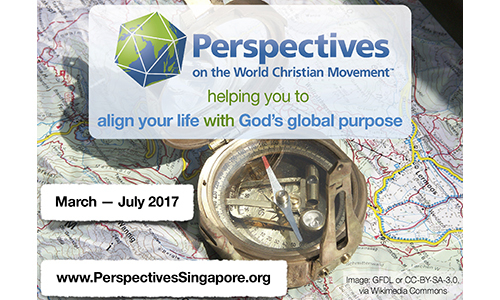 Organised by Perspectives Course Singapore, a partner of the Methodist Missions Society. Fees: $200 for working adults registering before 28 Feb, covering 15 classes and two course textbooks. Discounts available.